We analyzed over 25,000 data points to uncover the 10 most-tracked Facebook metrics that marketers are tracking and how they’re visualizing the data. According to a study by EdgeRanker Checker, the average post on a Facebook Page has a clickthrough rate of 0.15%. Put another way, a link that you post to your Facebook Page will need an average of 715 impressions to get one click. Or, 99.85% of viewers will not click your post (on average). Now, link clicks shouldn’t be the number one goal of your Facebook strategy, as depending on your budget and overall reach, you’d need a massive number of impressions to create any sort of click volume. Consider that Facebook users can indicate their interest–and engage–through a like, reaction, share, or comment. Facebook has a robust analytics tool that allows you to track these metrics on a post-by-post basis. 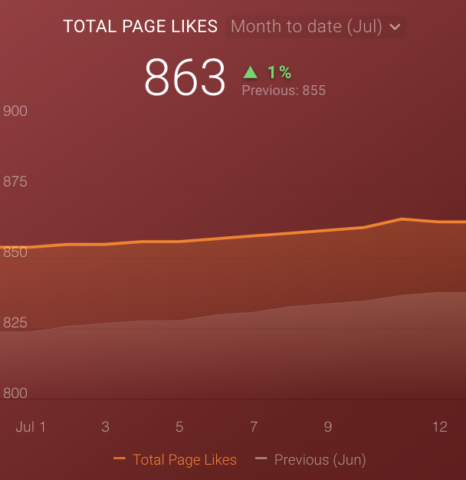 To understand which of these metrics are most popular for measuring the success of a Facebook marketing strategy, we looked at the most-tracked Facebook metrics from Databox users. In total, that meant analyzing more than 25,000 Facebook metrics being tracked in Databox. Here are the most-tracked Facebook metrics, with examples for how to track each one. 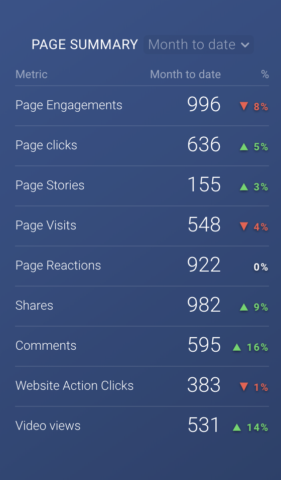 If you’d like to track the following Facebook metrics (as well as others that are important to you) in a similar fashion as what’s shown below, check out our free Facebook Pages dashboard and visualize your data in minutes. 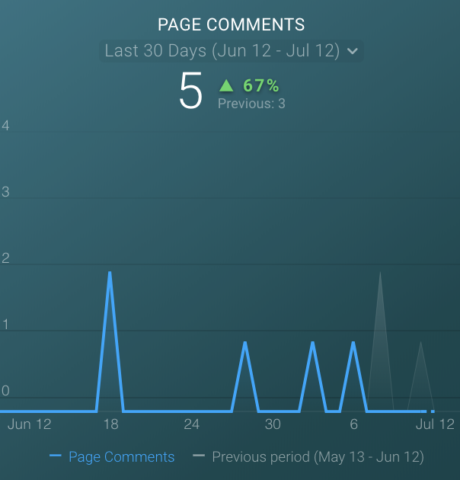 The “page engagements” metrics counts the number of uniques people that have interacted with your brand’s organic Facebook content. That includes anyone who has liked, clicked, commented and shared individual posts. It does not matter if people found those post via their newsfeeds or on the Page itself. It also technically includes people that reach out to your business via Messenger, although that is not common for most brands. Also important- this is the total number of people that interact, not the total number of interactions. 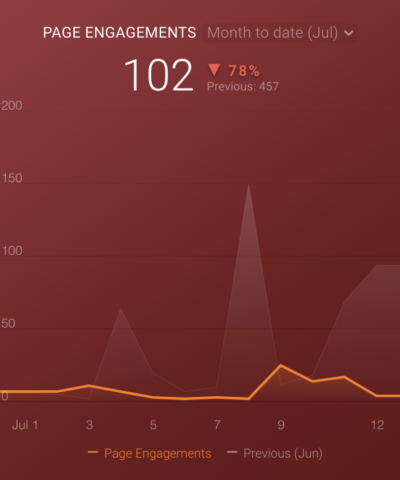 This gives you an overall view of whether your posts are cutting through the noise of the News Feed. It’s a good holistic measurement of whether you are reaching the 99.85% of people that will not click the link. Recommended Datablock: Use the line chart with comparisons turned on. This is the number of people that have “liked” your company’s page in a specified date range. Likes are analogous to “follows” on Twitter or Instagram or email subscriptions. They are the only organic way to improve the reach of your posts over time. And, Facebook suggests your page in the feeds of people whose friends “like” your page. This creates an even bigger opportunity to reach people in the same demographics as your fans. Recommended Datablock: A “Compare” datablock that includes page likes and unlikes. This one is pretty easy- it’s the number of posts published through your page. Sometimes, you can increase engagement by simply increasing the number of posts per week. Ah, if only it were always that easy. In other cases, you may need to spend less time cranking out volume and more time on creating clever content that will actually earn engagement. Facebook is protective over News Feeds. 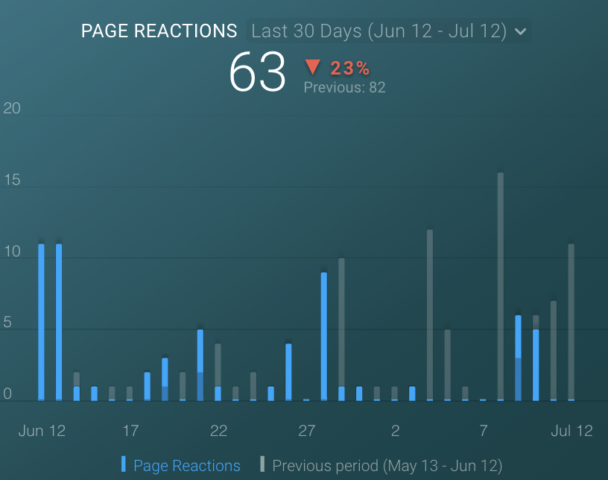 If your page shows low engagement over time, it will be harder for you to appear in relevant News Feeds. Recommended Datablock: Number Datablock with comparisons on. This is the total number of people that “like” your page. Hopefully, this is trending upward over time, since your fans must manually click your page to “unlike” it. This is not a direct indicator of the reach of your posts, since past engagement history also plays a significant role. This can be a significant asset if you plan on running Facebook Ads. You can either serve ads directly to this audience (if you believe they are not already customers), or you can use it to build a lookalike audience. Recommended Datablock: Line graph with comparisons on. This is the number of times that your page has been viewed by both logged-in and logged-out individuals. It could mean that people are seeing your posts and trying to learn more about your brand. Or, the page could even rank highly for a branded keyword on Google. This is the total number of reactions across all posts in a specified date range. Reactions are usually more common than comments or shares. 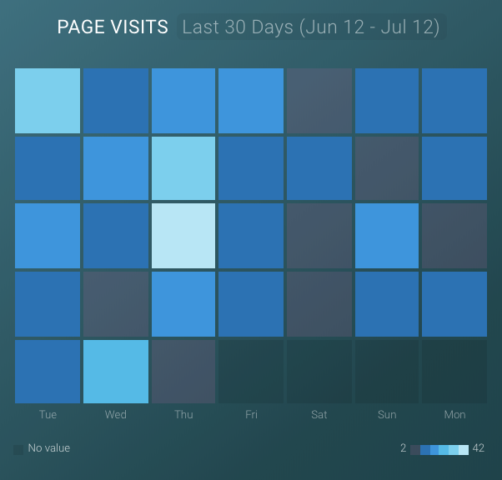 Recommended Datablock: Bar graph with comparisons on. 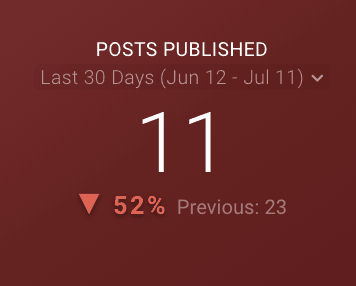 This is the total number of shares across all posts in a specified date range. Although these are usually more valuable than reactions, they are also harder to earn. Facebook users are sensitive about sharing content. Some companies run giveaways in order to motivate sharing. 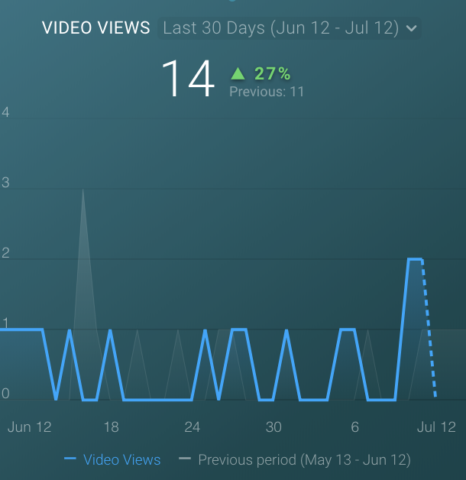 This is the number of video views over 3 seconds in length across all your videos. This year (2018), Facebook admitted that it prioritizes video in its algorithm, with extra emphasis on live video. If you can create video content, you have a much better chance of getting to the top of news feeds. Recommended Datablock- Line graph with comparison on. This is the total number of comments across all posts in a specified date range. One way to drive more comments is to ask an open-ended question in your post. But, it will need to be timely and provocative, since viewers will see the questions while they are absentmindedly scrolling through their feed. Recommended Datablock:Line graph with comparison on. In other words, the clicks that are not “engagements”, which was our #1 metric. Since this is the 10th most popular metric, marketers are reacting to low clickthrough rates by focusing on engagement rather than clicks. Recommended Datablock: Page summary table with comparisons on. Okay, so post engagements seem to be the most popular KPI, with 5 of the top 10 metrics falling in that category alone. That’s great for social media marketers just trying to start conversations. But, if you are thinking that these metrics seem pretty disconnected from generating revenue, I agree with you. 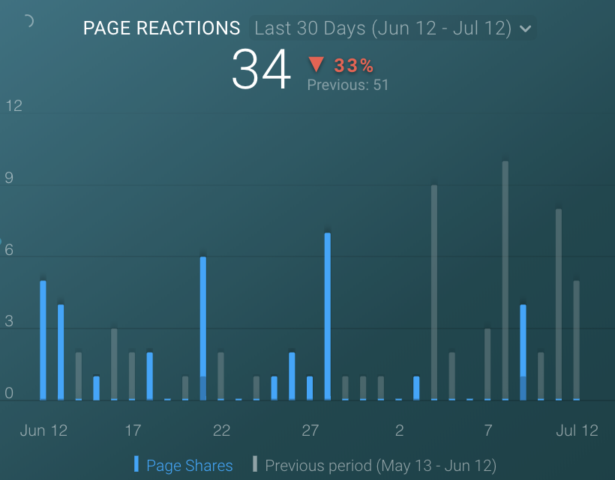 How the heck do page engagements translate to sales? In short, if you’re serious about using Facebook to grow your revenue, you need to use analytics data from other tools too. 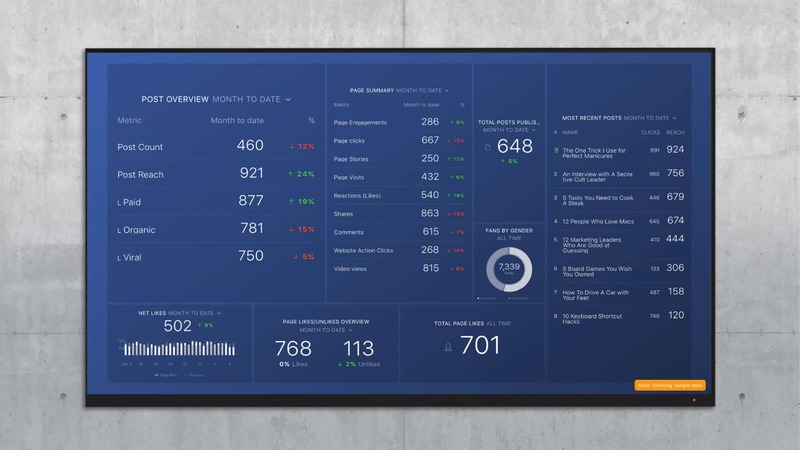 I’d recommend starting with our free Google Analytics Social Media dashboard. Do you have any other metrics that are essential for measuring your success as a social media marketer? Let me know in the comments.